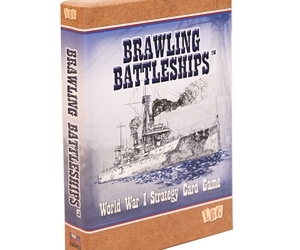 Brawling Battleships is a fast paced card game where you get to sink as many of these majestic ships as possible. Everyone is out gunning for your dreadnoughts and they are using every trick and weapon imaginible to sink them: Zeppilins, coastal forts, submarines, old pre-dreadnoughts, Mata Hari and many more zany and unusual dangers. Not to mention the withering fire from the enemy dreadnoughts themselves.